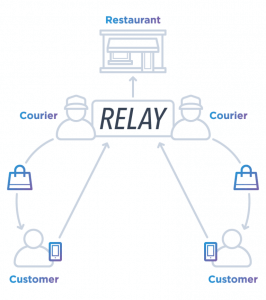 Relay Delivery, a restaurant delivery platform, pays its couriers using Dwolla, reducing its manual payout processing tasks by 100%, saving $1,200 a month. Relay Delivery is an online management and fulfillment platform that provides restaurants with an interface that consolidates orders across all order applications and a scalable courier force to meet their delivery needs. But outdated and manual payment processes created a productivity black hole. The restaurant delivery platform suffered from client onboarding obstacles and scalability problems for a fast-growing management and fulfillment platform in the restaurant delivery space. With only one developer available, Relay Delivery integrated Dwolla’s API for ACH in two weeks, cutting time spent performing manual payout processing tasks by 100% and reducing payouts processing costs by an estimated $1,200 per month. Restaurants use Relay to get a unified interface across all order platforms (Seamless, Grubhub, Eat24, etc.). Additionally, restaurants can tap into Relay’s scalable delivery force to empower their delivery needs, regardless of unpredictable factors influencing demand—such as weather and holidays. Prior to Dwolla, Relay gathered couriers’ banking information through a paper signup process, collecting voided checks and manually typing routing and account numbers into their online banking interface. 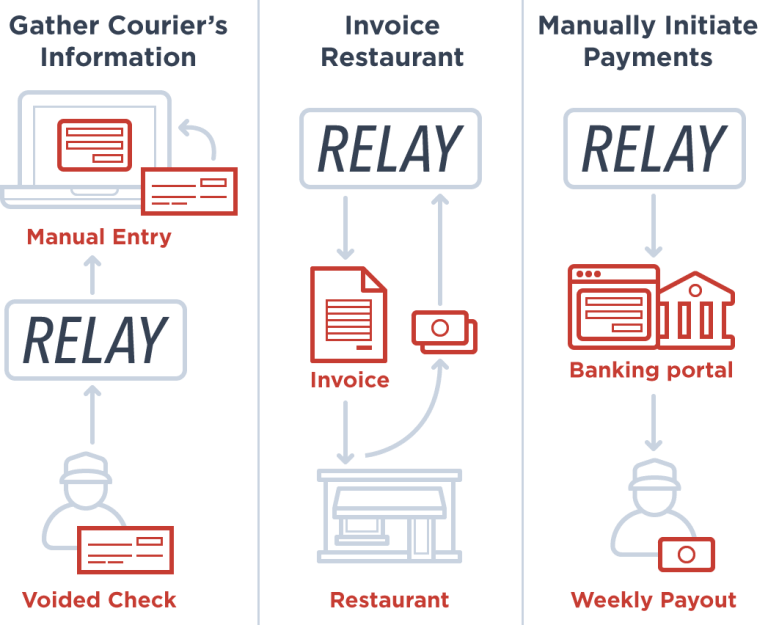 Relay invoiced the restaurant for the service provided, and paid-out its couriers through its online banking portal, logging in and initiating single payments to each courier’s bank account on a weekly basis. Relay saw a 30% increase in courier registration completion, and reduced individual courier onboarding time by 50%. To capture the market opportunity Relay knew a seamless onboarding experience and automated payments would be key to attracting and retaining couriers. Time was spent manually onboarding new couriers, collecting their bank account information and tediously disbursing payments weekly. After exploring various payment solutions to replace their manual payouts processes—and considering expanding its relationship with their banking provider—Relay Delivery used Dwolla’s RESTful API so accountants could initiate payments to couriers with a few clicks of a button. Payments became automated and initiated more quickly. 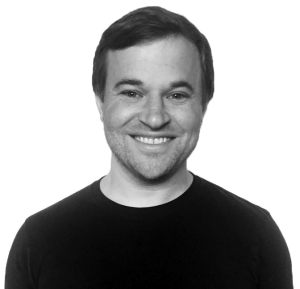 The flexibility and payment automation of the Dwolla API allowed the team at Relay to decrease time spent on manual accounts payable tasks by 100%, effectively automating and eliminating any in-house work for payroll enrollment. By decreasing time spent on processing payouts by eight hours each week, Relay netted an estimated savings of $1,200 per month. In addition to automating payouts, most providers Relay considered charged high per-transaction fees to facilitate ACH payments. Relay needed a payment platform that provided nearly 100 percent uptime, while handling large bursts of requests at any given time. They also needed an infrastructure that didn’t chip at their profit margins. To accelerate and properly test the integration, quality technical documentation and a fully functional sandbox were hard requirements. Relay entered into a flat monthly payment structure to access Dwolla’s API and programmatically initiate transfers to its couriers’ bank accounts. Relay was able to integrate the Dwolla API receive-only functionality in two weeks with their single developer. With predictable month-over-month pricing, Relay can scale without worrying about unpredictable processing costs. Onboarding new couriers to work for Relay was a manual and painstaking process. From collecting bank details for every person, to manually dispersing paychecks weekly, it was clear that with our rapid growth that it could not be sustained. In implementing Dwolla, we’ve fully automated the signup and disbursement phases—we’ve freed ourselves to focus on what’s important, our business.